Dr. Praveena Saraf has obtained her MBBS and MS from R.N.T Medical College, Udaipur, India. Dr. Praveena has also done an internship at R.N.T Medical College, Udaipur, India. She also has conducted a research project on Obstetric & Gynaecological profile following ectopic gestation. Dr. Praveena also has many publications to her name. Dr. Praveena keeps herself updated in her chosen field by attending numerous conferences and workshops, both local and international. 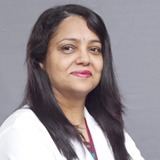 Dr. Praveena has extensive clinical experience having provided the highest level of obstetric care to patients in last 20 years of the practice. She is associated with NMC Specialty Hospital since its beginning and is one of the senior most Gynaecologists. She is dedicated to providing for the special health needs of women of all ages, whether they are just entering puberty, expecting a baby or traveling through menopause. She is considered to be an expert in high risk pregnancies. Her special areas of interest include managing normal, high risk and caesarean sections. Dr. Praveena can communicate fluently in English and Hindi.